The 5-tool player is a professional baseball scout’s dream ballplayer. They’re the players who excel at all 5 key aspects of the game: Hitting for power, hitting for average, throwing, fielding, and base running. I’ve always been fascinated by watching professional athletes perform, particularly in the game of baseball. I find it inspiring. Not because I dream of playing centerfield for the New York Mets in my lifetime. I gave up on that dream by the age of 10. It’s inspiring because these guys are the best of the best. They’ve got their skills completely dialed in. They make it look so easy, and most of what they do does come easy to them. But even at the pinnacle of success, they’re still out there hustling, working on their game, hitting the gym, getting their batting practice in, analyzing video tape, and on and on. That hunger to continuously up your game and raise the bar is what inspires me. It fires me up every time I settle in to watch the Knicks play at Madison Square Garden. And it motivates me when I’m talking to other entrepreneurs who are making it happen in their businesses. Over the last few weeks I’ve been making a conscious effort to become a better blogger. Blogging isn’t a particularly new exercise for me. I’ve been blogging for years now. But I feel I haven’t raised my blogging game to the point where it breaks away from the pack. That point where real traction takes hold and things start to snowball. I think there are a few key qualities that the great bloggers do extremely well, which most of us fail to do or don’t do consistently enough. And that’s the topic for today: How to become a 5-Tool blogger. These are the 5 things that will help you and me take our blogging game to the next level. Most people who are new to blogging basically write whenever they feel inspired, and hit publish as soon as they type the last word of a post. They keep a running list of ideas for blog posts. Then they set aside time to give some serious thought as to which ideas will resonate most with their audience. They keep an editorial calendar and schedule the posts to publish at the optimal times. They also produce most of their content ahead of time, so that they’re never under the gun of a looming deadline. This can be really effective for podcasters. Have you guys heard about John Lee Dumas’s podcast, Entrepreneur on Fire? He publishes a new podcast episode every single day, 7-days a week. Do you think you records and edits an episode every day? No. He records all 7 episodes on Monday, and schedules them to publish for the upcoming week. David Siteman Garland calls it “getting off the content treadmill”. He records a month’s worth of Rise to the Top episodes and drips them out over time. The best bloggers know that having an awesome blog isn’t only about your website. It’s just as much — if not more — about having an awesome email newsletter. And I don’t mean just placing a mailchimp subscribe box in the sidebar of your blog and calling it day. That’s the step where most people stop, but the pro’s just begin. The 5-Tool Blogger puts as much effort into his or her newsletter as they do their blog. They thoughtfully craft an email and send it to their list every single week. They setup an autoresponder sequence, carefully planned out with high-value content. They get personal in their email newsletter. They let their subscribers know that they’re a real human being, writing a real message, and they ask for a reply. The blogger who is on their A Game doesn’t stop working once the post is published or the email newsletter is blasted out. They’re engaged in relationships, behind-the-scenes, continuing to provide value above and beyond what they’ve already provided in their blog articles. When you’re putting out lots of content that resonates with an audience, you’ll inevitably receive emails from your readers. They’ll ask questions, or share their own story, or tell you what they’re working on. I even use an email autoresponder to ask my newsletter subscribers to reply to me and tell me what’s challenging them right now in their business. And then I set aside time each week to reply to every response, sharing whatever knowledge I can to help them in their path. Maybe it’s a link I came across recently, or maybe I experienced the same issue a few months back, so I’d share how I worked through it. Building relationships with readers happens just as much in your public-facing blog posts and comments as it does behind the scenes over email, at the conferences, at meetups, at your local coffee shop. And as much as it’s about giving in sane amounts of value and time to your audience, the benefit goes both ways. You as the blogger get to learn exactly what’s on the minds of your readers. You can use that information to help you decide what to write next. 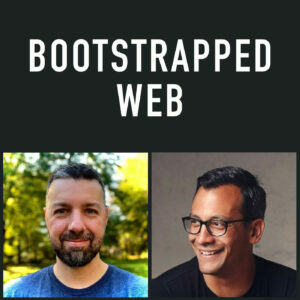 I learned a ton about building a newsletter and interacting with subscribers during my interview with Brennan Dunn a few weeks ago. The best bloggers know that it’s not about what’s in it for them. It’s about what’s in it for the reader. They are completely mindful of what their audience is after. Most of the time, their audience wants to learn something or better themselves or their work in some way. The 5-Tool Blogger knows that their reader is always thinking, what’s in it for me? So they deliver the goods, every time. And that’s where the social and viral aspect really comes into play. When you’re truly delivering something of value to your readers, and they recognize that, then they are much more likely to share your content with their audience. When someone chooses to click that Tweet button on your content, they know that it’s as much a reflection of their own reputation with their followers as it is a reflection on your reputation as the blogger. So make your reader’s decision whether or not to share your content a no-brainer, by constantly giving them something of value. One of the key takeaways from my interview with Nathan Barry a few weeks ago was that it only took a few in-depth, educational tutorials to gain traction and help him build a solid email list which eventually helped his first book become a success. Finally the fifth key quality of the 5-Tool Blogger is to hone some killer writing chops. What I mean by that is it’s not just about picking the right topic and publishing something educational. You have make it interesting. You have to keep your readers hooked on every word. You have to develop a connection with your reader. To do this, you have to develop your voice as a writer. Your style. Your persona as a writer. Yes, I think it’s important that your own personality shines through in your writing, but you have to learn how actually do that with words, paragraphs, headlines, transitions, and so on. I think the way that each of us learns how to write and improves our chops is different for each person. I think it comes down to two things: Reading a lot and writing a lot. The more we read, the more we’re exposed to different writing styles. And I don’t just mean reading other blogs in your niche. Try and make a point of reading books, magazines, websites, across all different subject areas. I admit, this is something I’m trying to work on. I tend to stick mostly to business and startup blogs, but I plan to do more reading elsewhere. I heard great things about this biography of George Washington, so I think I’ll pick that up soon. And of course, you have to constantly be writing. We hear again and again that the key to becoming a better writer is to write something every single day. It’s true. I firmly believe that writing is a muscle and the more you exercise it, the stronger it gets. When a young comic asked Jerry Seinfeld for his advice on becoming a better comic, He said the way to be a better comic was to create better jokes and the way to create better jokes was to write every day. So if you want to be a better writer on your blog, make it habit of writing something every day. Now here’s a little tip about that: You don’t need to write something for your blog every day. In fact, you shouldn’t. Only your very best stuff should be scheduled to publish your blog. But you should still write something every day. I recently started a habit of journaling. I started using Day One app, which is an app for iOS and Mac for keeping a private journal. I try to write down things I’m thinking about — mostly related to my business — at least once or twice per day. This is a really informal, and totally personal approach to writing. There is no editing involved. I almost never hit the backspace key when writing in my journal. Editing doesn’t matter because I’m the only one who will ever read it. But it’s a great way to hone the skill of pouring words out onto the screen. Now, when it comes to publishing content for the world to see — editing is crucial. In fact, part of becoming a great writer is becoming an even better editor. Every assignment would be delivered in five versions: A three page version, a one page version, a three paragraph version, a one paragraph version, and a one sentence version. I don’t care about the topic. I care about the editing. I care about the constant refinement and compression. I care about taking three pages and turning it one page. Then from one page into three paragraphs. Then from three paragraphs into one paragraph. And finally, from one paragraph into one perfectly distilled sentence. Along the way you’d trade detail for brevity. Hopefully adding clarity at each point. This is important because I believe editing is an essential skill that is often overlooked and under appreciated. The future belongs to the best editors. So that’s what it takes to become a 5-Tool Blogger. I certainly have a lot of work to do if I’m going to get there. But that’s what this game is all about. Keep doing it, and do it again. Learn by doing. This is excellent advice for building an audience. For becoming a great blogger I think you hit the nail on the head with Jerry Seinfeld’s advice. Nothing beats practice. Fred Wilson has published daily since 2003. His blog is just his own thoughts on what is happening around him. I find it interesting to go back and see that truly great bloggers start with a commitment to write regularly. Getting your thoughts out of your head and onto the page is a learnt skill. One that improves through consistent effort applied over a period of time. Indeed Jervis. We hear that advice again and again. Want to get better at something? Do it every single day. It’s true.